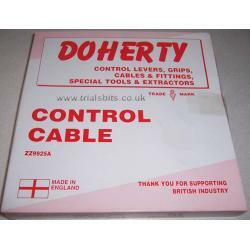 This is a Doherty made T20 Tiger Cub Clutch Cable for the sports models 1965 onwards. 51" outer, small 1/4" barrel. Equivalent to original part number 60-0567, or D567. Made in England by Doherty, the box may be a bit scruffy and / or faded.